Unbroken Glass kicks off its week-long run at the Gene Siskel Film Center tonight! 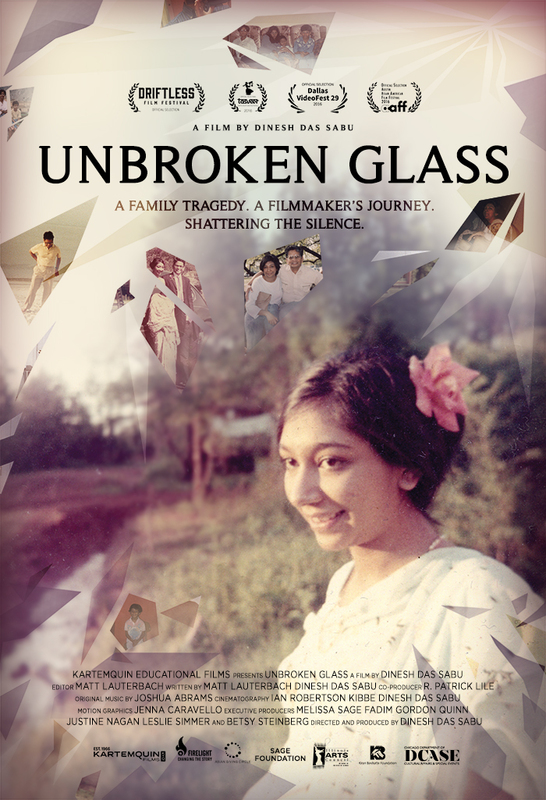 Unbroken Glass, the debut feature film by director/producer Dinesh Sabu will begin its week-long run at the Gene Siskel Film Center at the School of the Art Institute of Chicago beginning February 17th and running through February 23rd. Purchase tickets HERE. In anticipation of the run, Dinesh has been featured on WBEZ Morning Shift, WGN's The Download with Justin Kauffman and on Good Day Chicago, interviewed by film critic Richard Roeper! Cine-List: "A painstakingly intimate documentary...Its unpolished aesthetic befits the film’s informal approach, both of which are aspects of the film that set it apart from the profusion of overly slick and lumberingly personal documentaries that pervade film festivals and streaming queues alike." Ian Simmons, Kicking the Seat: This alternately heartfelt and shocking cinematic journey delves into schizophrenia, cultural identity; and the realization that our parents were people before we entered the picture. February 17, 8:15pm - Q&A with Dinesh Das Sabu, Gordon Quinn and Sangeetha Ravichandran. Moderated by Howard Reich. Co-hosted by Kartemquin Films. February 18, 3:30pm - Q&A with Dinesh Das Sabu. Co-hosted by Indo-American Heritage Museum. February 19, 5:30pm - Q&A with Dinesh Das Sabu and R. Patrick Lile. February 20, 8:30pm - Q&A with Dinesh Das Sabu. Co-hosted by National Alliance on Mental Illness (NAMI) Chicago. February 22, 8:15pm - Q&A with Dinesh Das Sabu, IFP Chicago Executive Director Nicole Bernardi-Reis, Editor Matt Lauterbach and Kartemquin Director of Editing Leslie Simmer. Co-hosted by IFP Chicago. February 23, 8:15pm - Q&A with Dinesh Das Sabu. Co-hosted by Eye on India Festival. Unbroken Glass - Official Trailer from Kartemquin Films on Vimeo. Find a full schedule and purchase tickets here.